The days from April 26th through May 1st of 2015 are pattern rich. We will likely also discuss more patterns that will occur in early May in another post that covers patterns after May 1st. 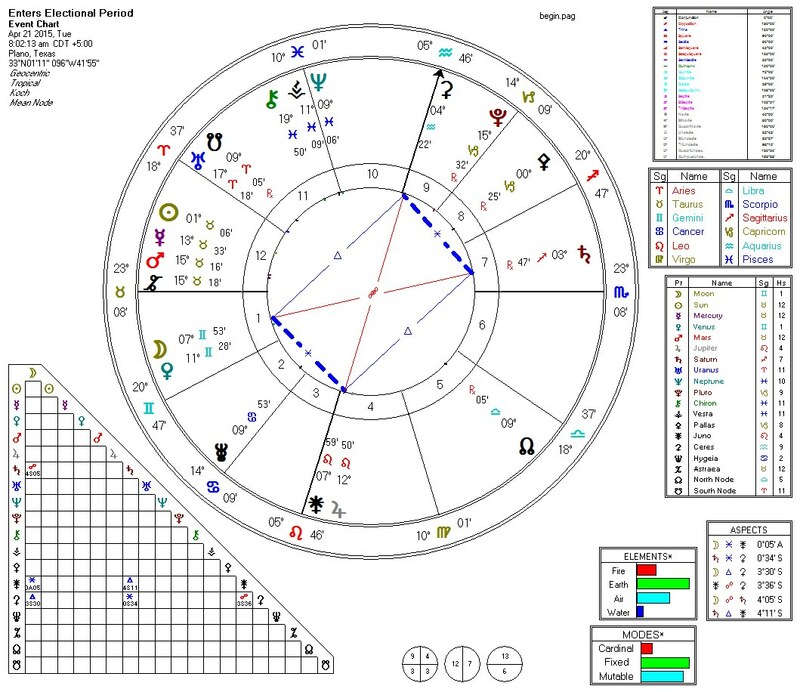 We begin with the Double Yod Key (DYK) that starts April 26th and continues through May 1st. This is one of the “longer acting” patterns of this period (we are looking at primarily April 28th through May 1st with some patterns extending on each side of that range). It colors all of the other patterns we will subsequently discuss. That pattern tells us that, once again, we are in a pattern of making important decisions. However, as we will note momentarily, this period is about more than decisions. This period is also about action. 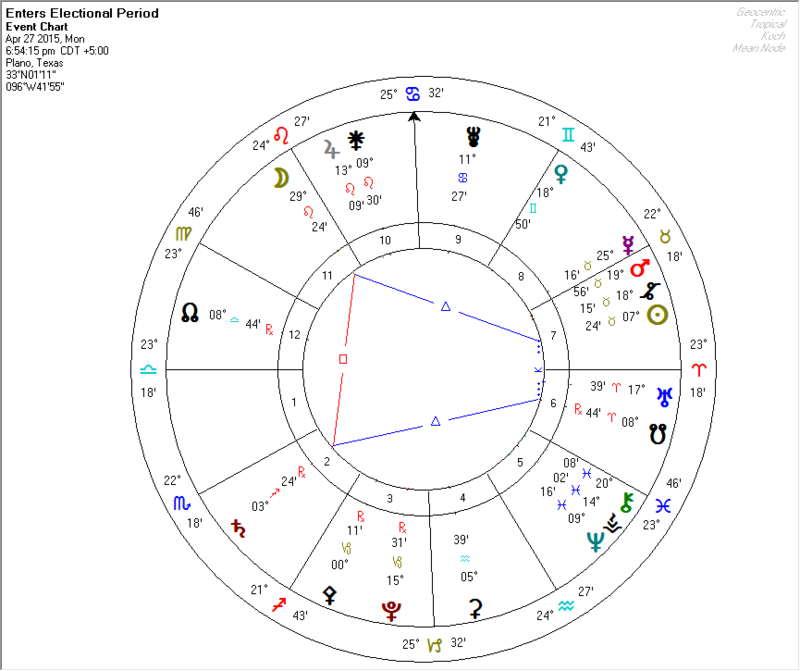 April 28th contains two grand trines. These present days where things might feel so good that we let the golden opportunity breeze by us. Don’t make that mistake. Keep your eyes open. A mystic rectangle is also present on April 28th. This one tells us to take notice of health care issues and to take care of those problems. Identify them, knock them out, and move forward. 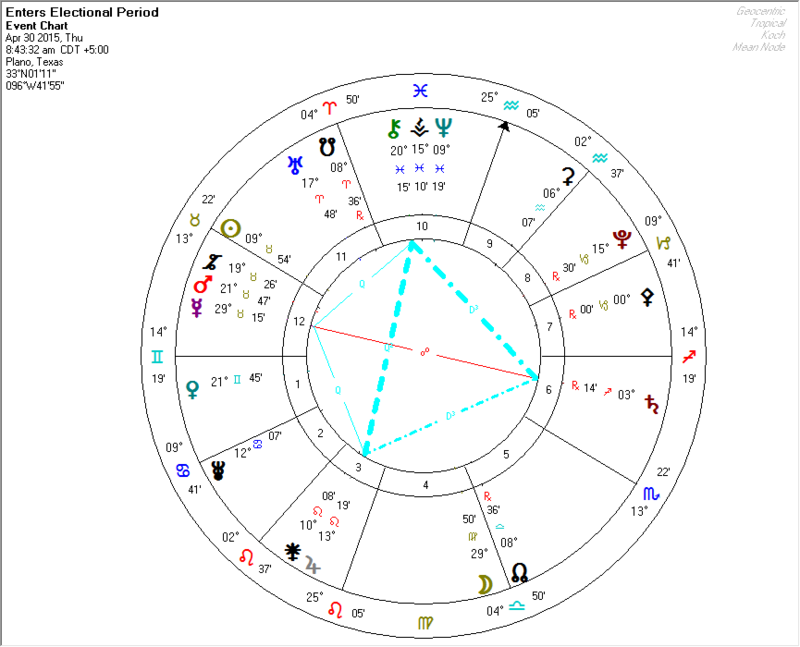 A Quintile Kite from April 30th to May 3rd tells us that this is a period where we can be productive in terms of creativity. At least write down the ideas, and better yet develop them to fruition. May 1st things become dicey. 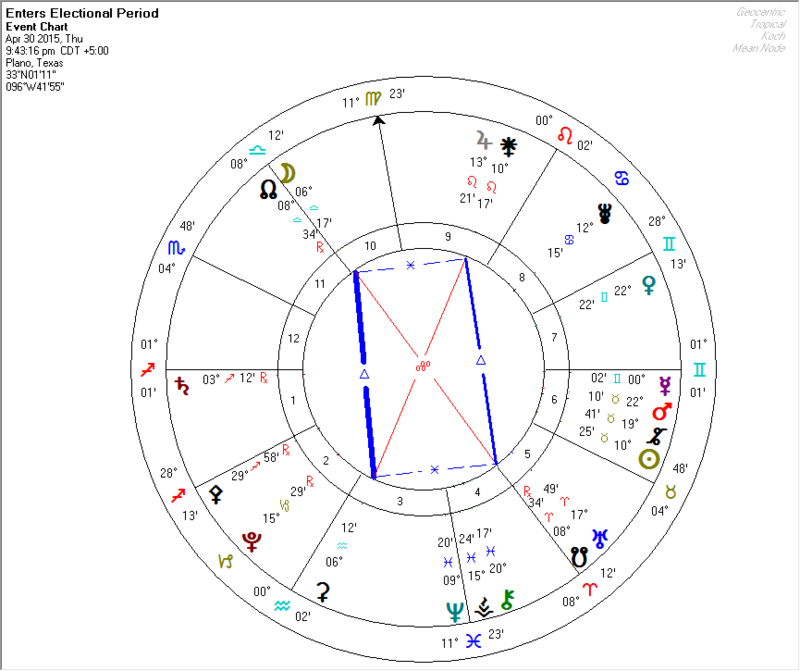 A Grand Cross tells us to watch our tempers but, again, gives us energy to get things done. A “Kite Almost” does present us with an opportunity on May 1st. We will have to act quickly yet keep our head. 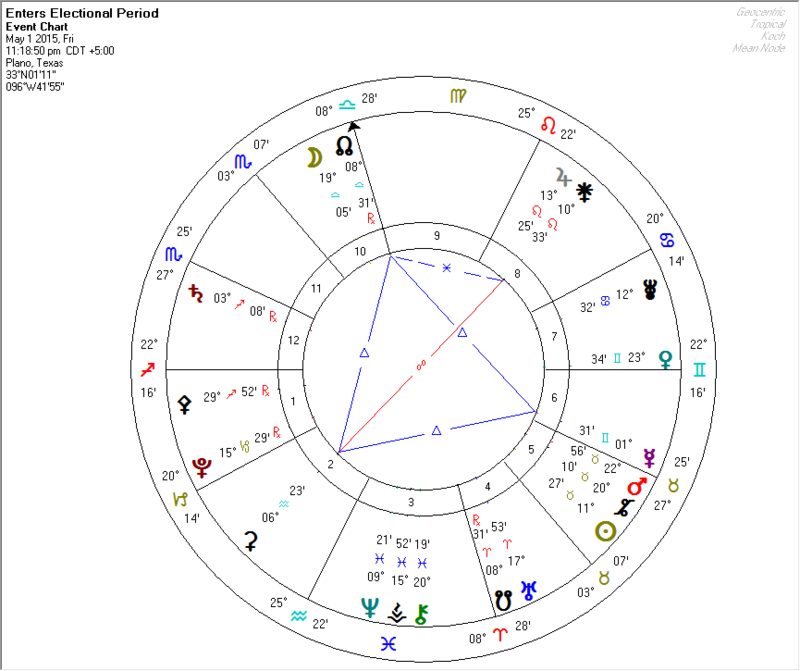 On the more positive side, this pattern may give some of us the focus and energy to accomplish some important project. Just remember the lesson of the magic genie: make certain what you ask for is what you really want! 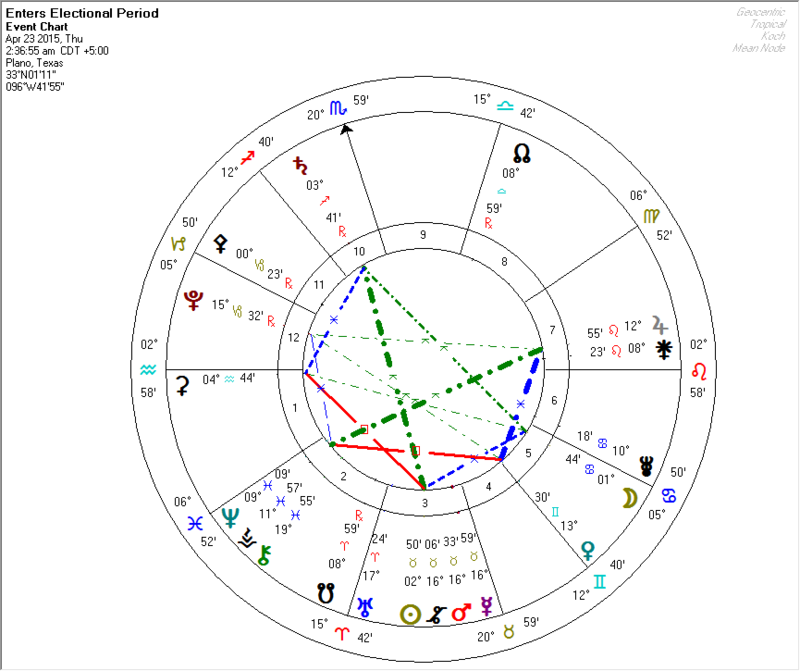 This will tend to affect Capricorn (especially early January), Aries (especially near April 10th), and Taurus (near May 5th) the most. 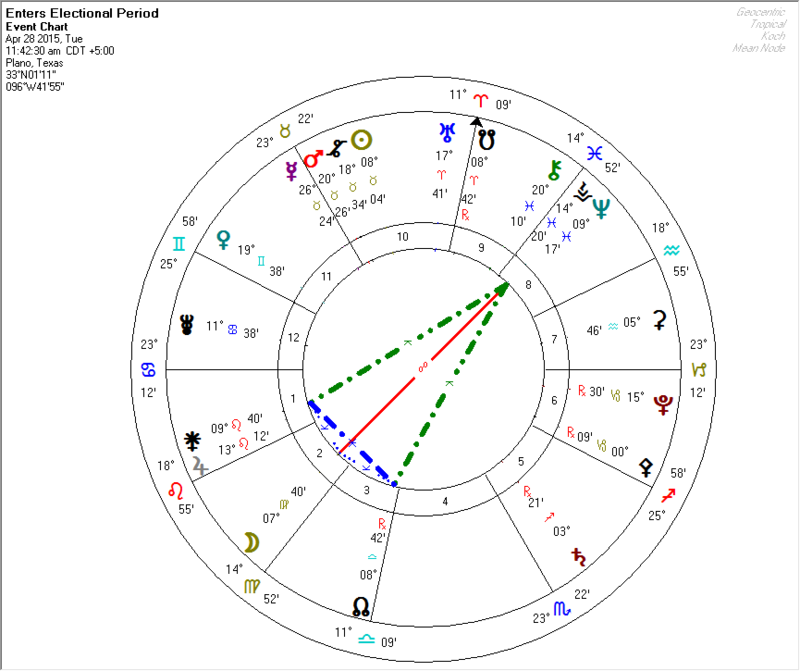 Opposite points in Cancer (near July 1), Libra (near October 1), and Scorpio (near November 3rd) will also feel this more than others. 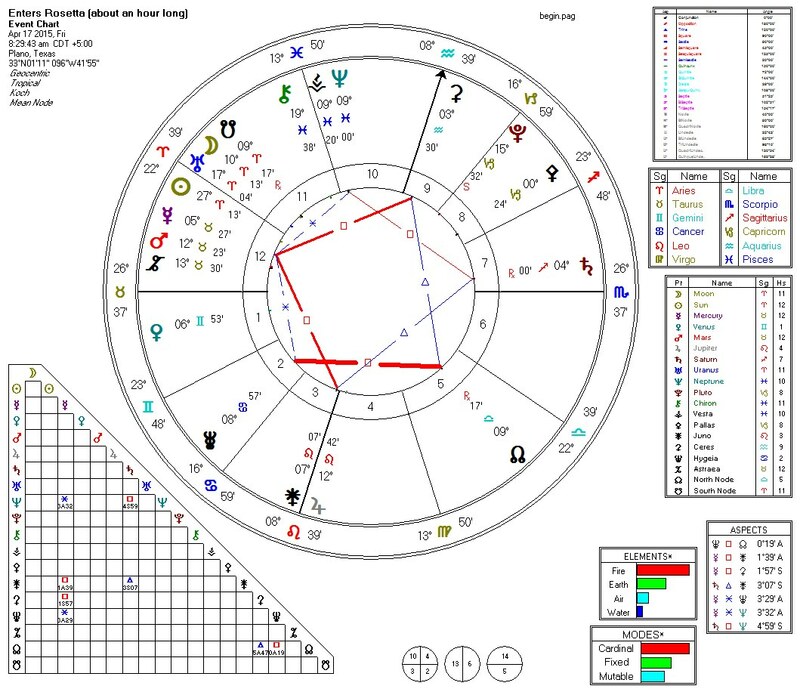 Maybe the best explanation of what these lessons are about might be Whole Astrology’s recent description of Capricorn. If you do not keep a journal of some kind, then this might be a good time to start. Make detailed notes from April 22 through May 11th and then put them in some place where you will come back to them, maybe at the time of your New Year’s Resolutions or a year from now. What lessons did you learn from this period? If your journal is digital, make certain to include pictures and video from this period. 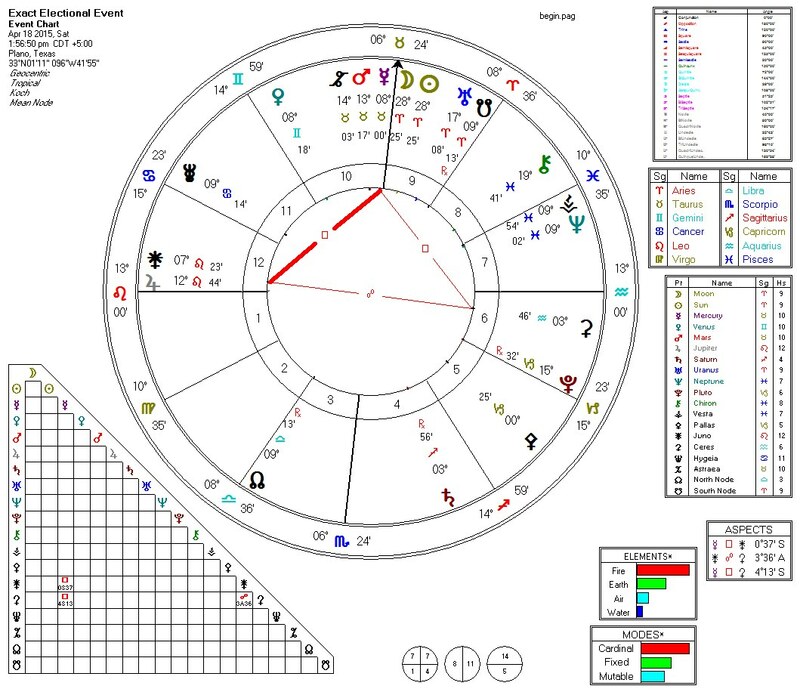 Note TWO DYK’s in play in the early hours of April 23 (in North America, but fully affecting Europe on this day). A single DYK indicates that decisions need to be addressed. With TWO DYK’s in play, almost all of the planets are consumed with decision making. You will find that you need to decide which decisions are most important (a meta-decision). 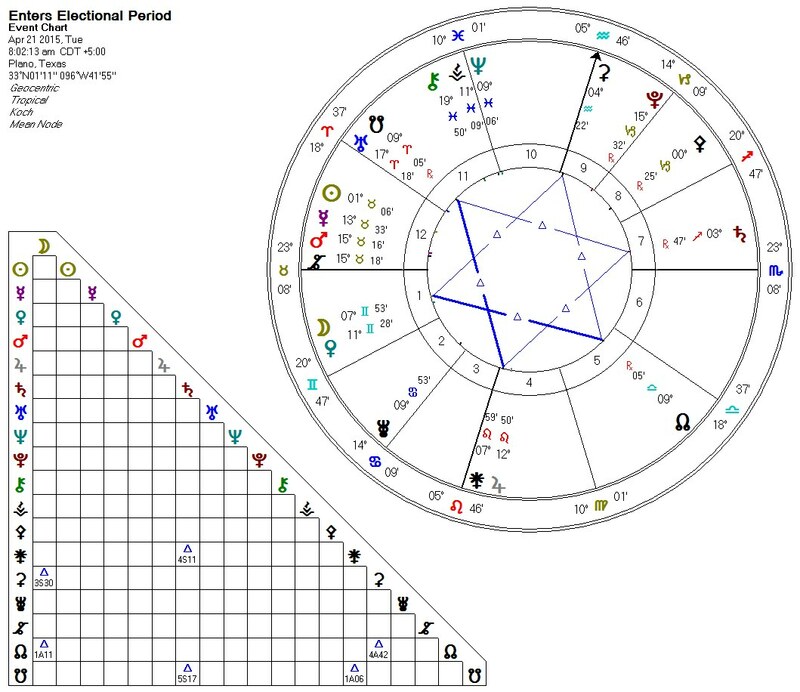 This one appears to be a followup to April 23rd and a prelude to the mass of complex patterns that are in play April 28th through May 1st. Looking for more information on yods? 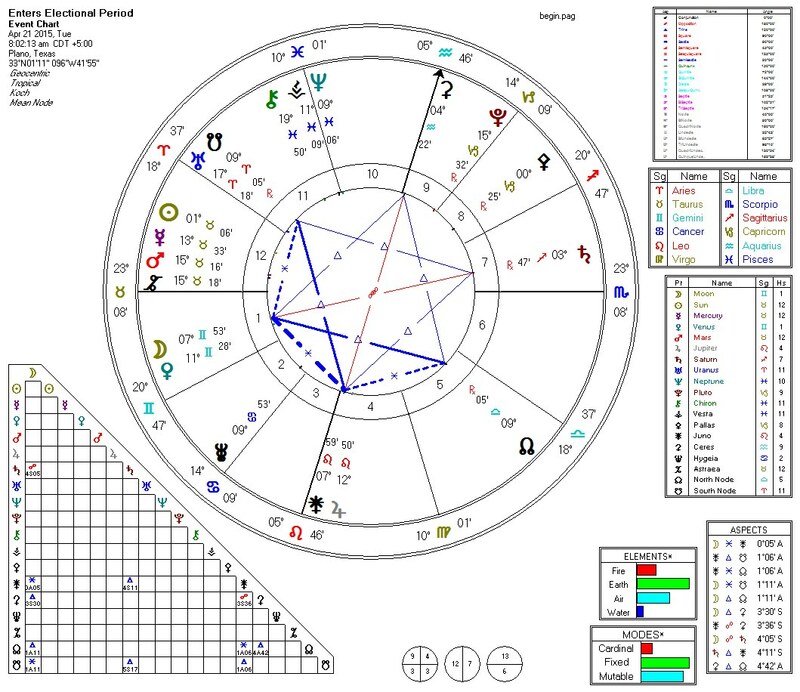 We note that startlingly this pattern looks like a “Star of David” although it is not classified as a Star of David pattern by Solar Fire 8 (SF8). We find that a Yod is present also. 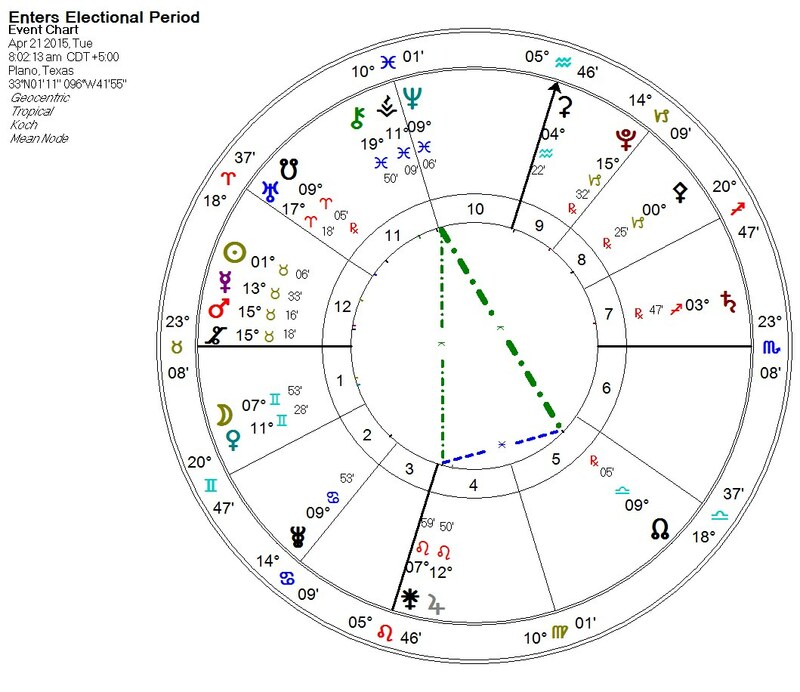 This makes this a day about decisions, and the decision is between a path that involves trust/mistrust on one hand (Juno) and another path that involves much (worthwhile) hard work on the other (the Node). 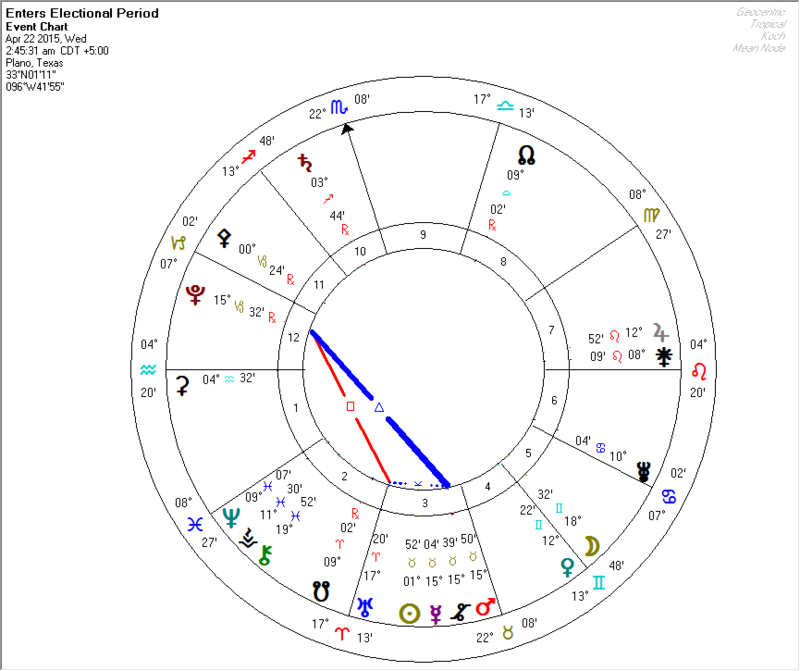 Neptune at the apex tells us that the decision may not be clear at all. Still, for those who can keep their head, the multiple overlapping Kites tell us this is a Day of Opportunity. 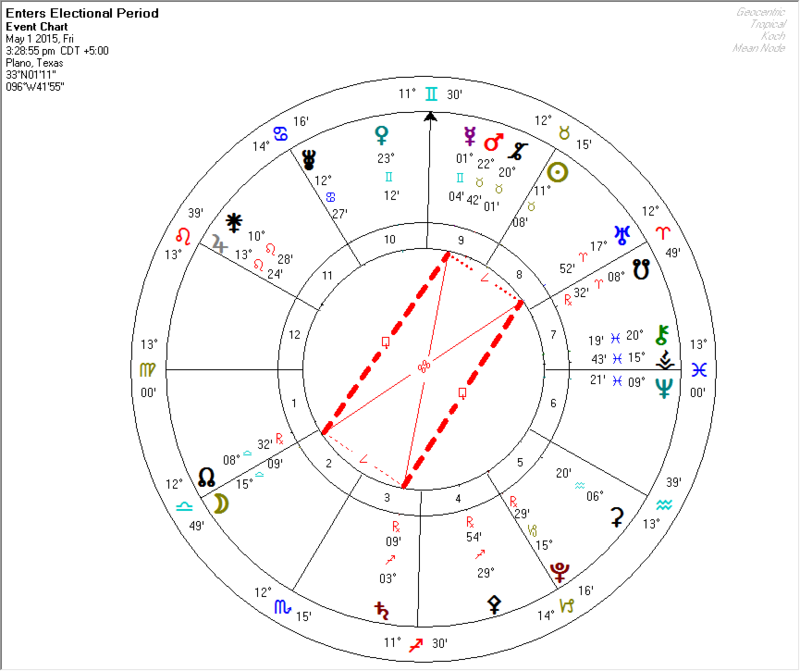 Finally, we identify the presence of a “Mystic Rectangle.” While we are not sure what this relatively rare pattern means, we believe that it is related to “good luck” and unforeseen opportunities. We suspect that this will be a “day to remember” for many people. We have been having problems with search engines no longer ranking us on new posts (or ranking us very lowly), so if you want your friends to be able to find and read this article then please email the link to them. 3. You will have at least one opportunity today, but you will probably have too many and will have to decide which one. 5. For some people, this will be a rare, possibly once in a lifetime opportunity. 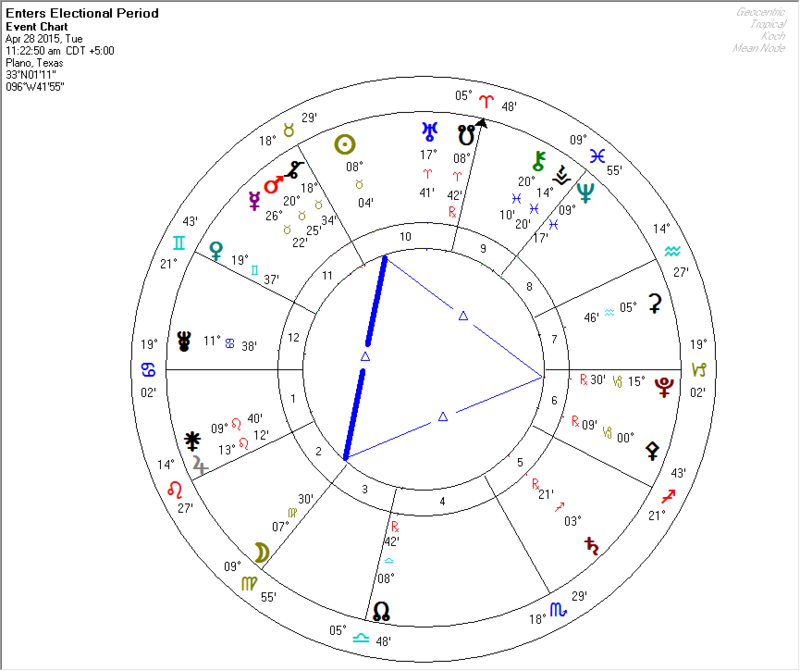 We will likely update this page in the days leading to the New Moon. I’m writing this to warn you about a very dangeorus scam. I’m just slowly recovering from a weeklong nightmare. On Monday morning, I went to use my computer, but the startup page was locked, with a phone number I was to call. The person who answered said he was from Microsoft, and that the computer was locked because my 5-year warrantee was up. If I didn’t renew it immediately, it would crash and I would lose all my files. He offered me several plans, from 3-5 years, for anywhere from $150-$350, but pressured me to get the money to them that very day. 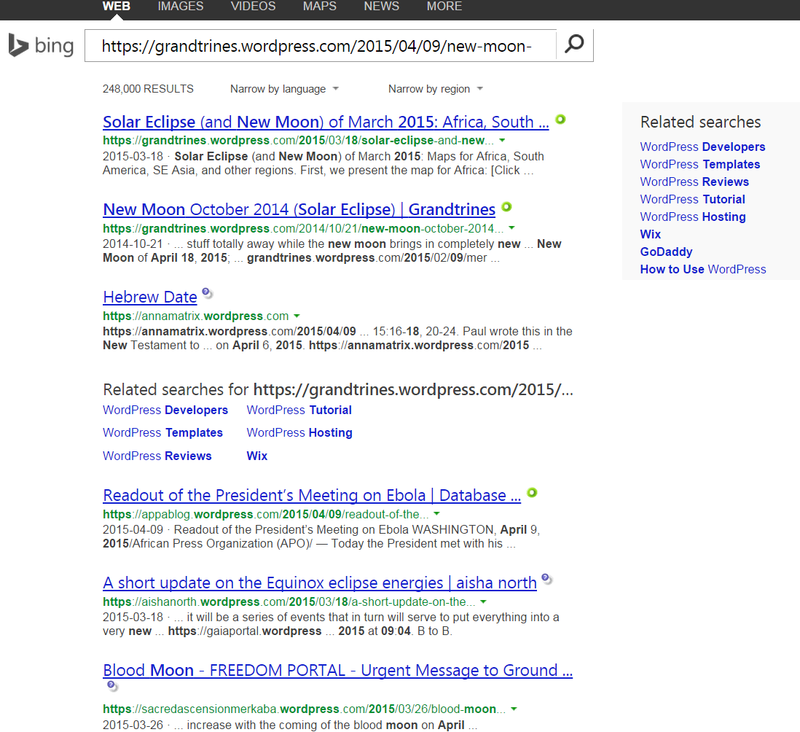 Bing and Google appear to have decided to NOT list the New Moon analysis for April 2015 on their search engines. (Try it. 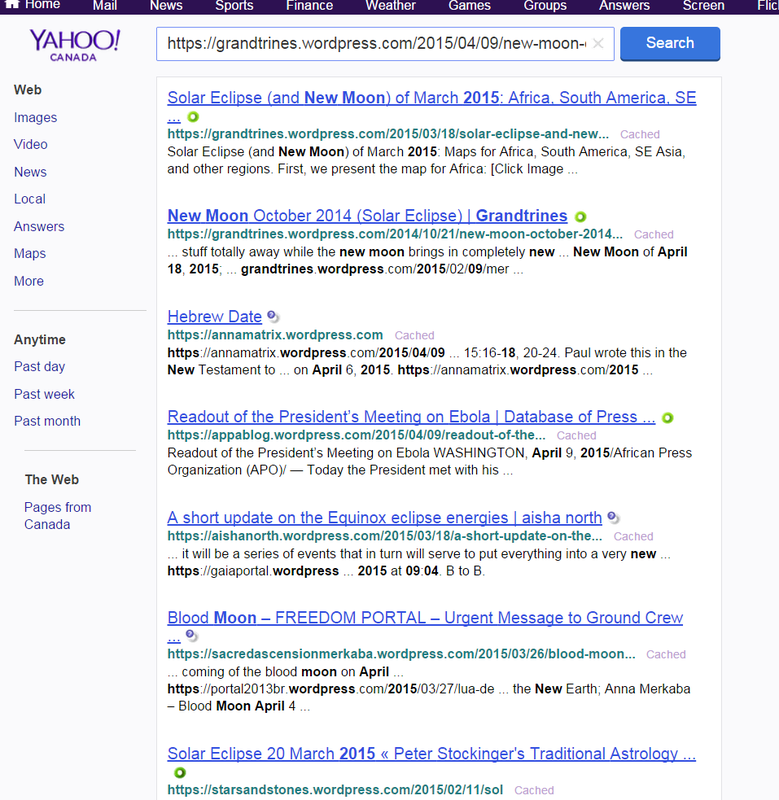 Do a search for “New Moon April 2015,” and see if you find the entry for this site for that event.) Could be that someone “reported” the blog to blacklist it. In any case, new entries do not show up in the search engines. 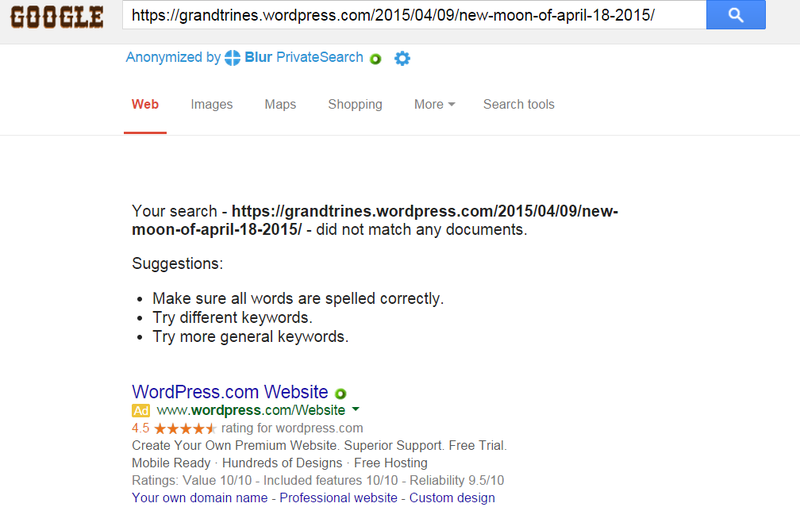 “https://grandtrines.wordpress.com/2015/04/09/new-moon-of-april-18-2015&#8221; to Bing / Google to see it comes up at all. Update April 15th: Bing technical support has been responsive, and SOME of the new pages are showing up in some of the searches now. 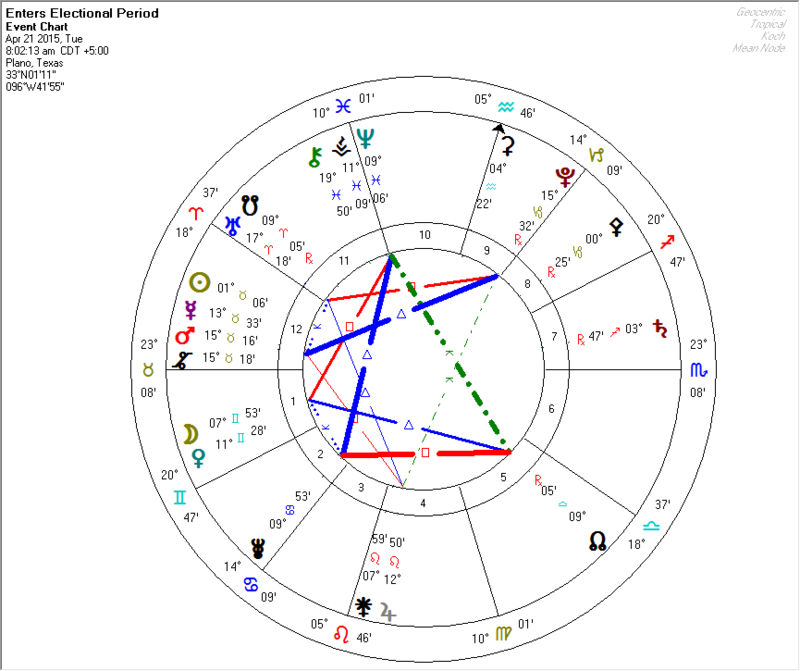 April 18, 2015 at 11:57 am PT is a new Moon in Fire sign Aries. 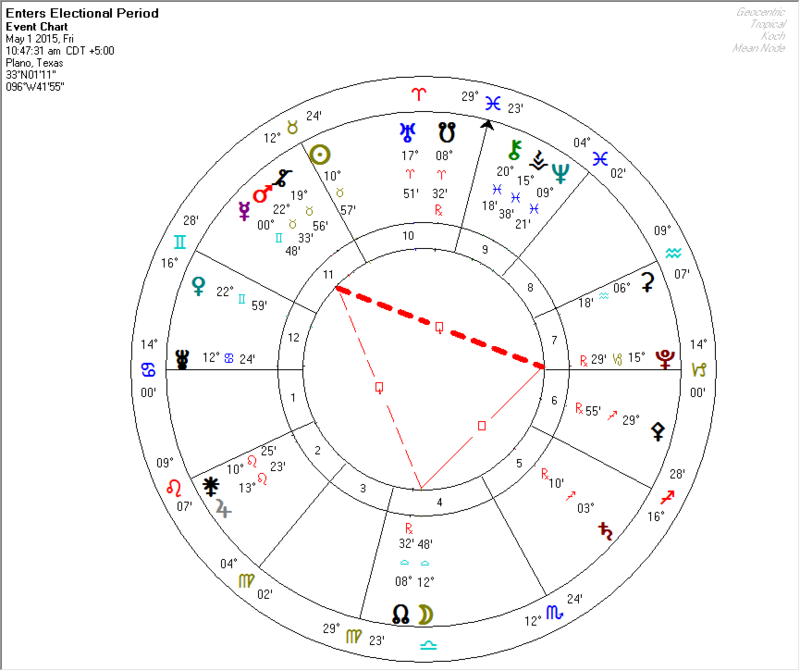 Time to take action before Mercury goes retrograde in exactly one month on May 18. This new Moon is also fortunate to plant seeds for new growth and long-range development. Spring and summer are the action seasons of this Wood Sheep year so energy is with you to accomplish your goals. 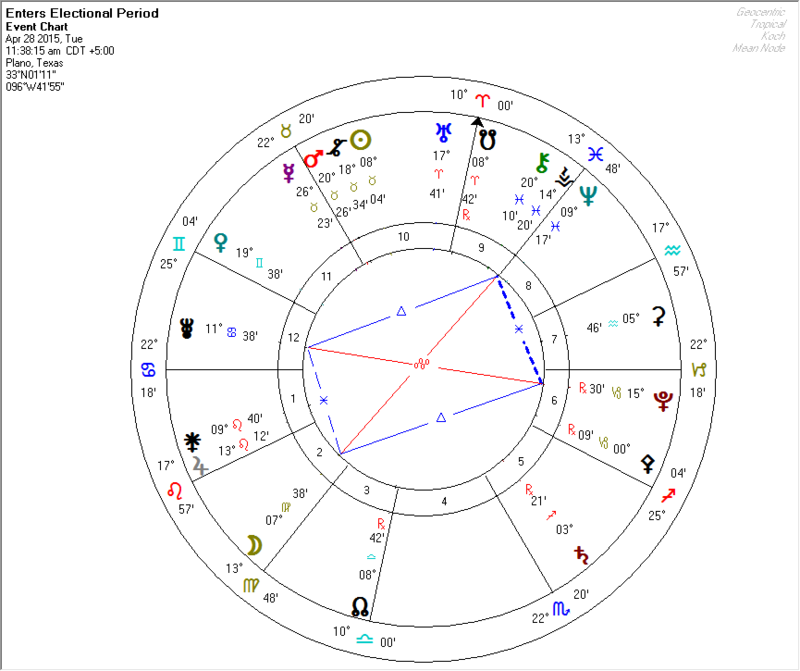 Earlier this same day, we have overlapping and linked Rosettas (linked by Mercury) that arguably might be called a “Double Rosetta Key.” Rosettas tend to be about unstable alliances (and possibly treachery), so please do be careful who you confide in at this time. 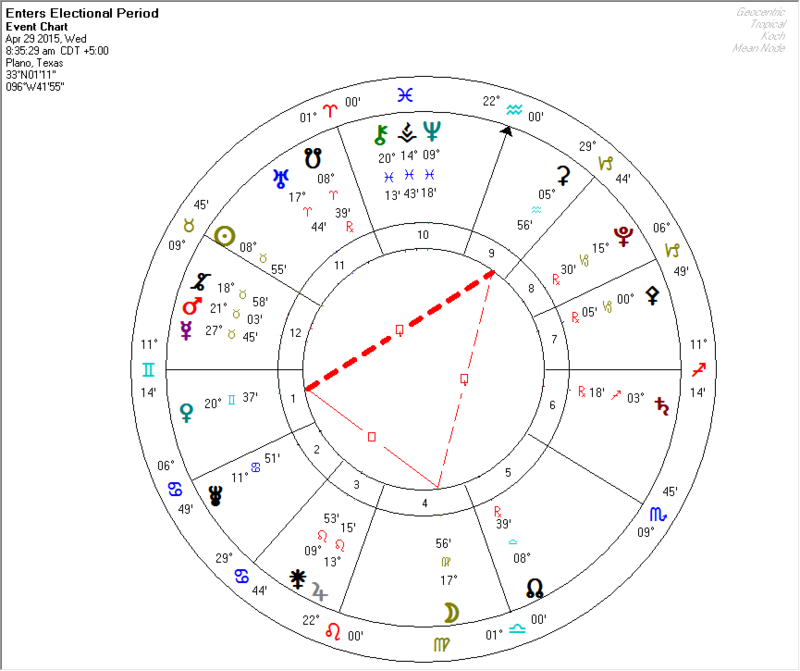 Although other patterns precede the new moon in the days before and after, this is the only pattern truly “near” the new moon and it conveys a single simple message: treachery is afoot. 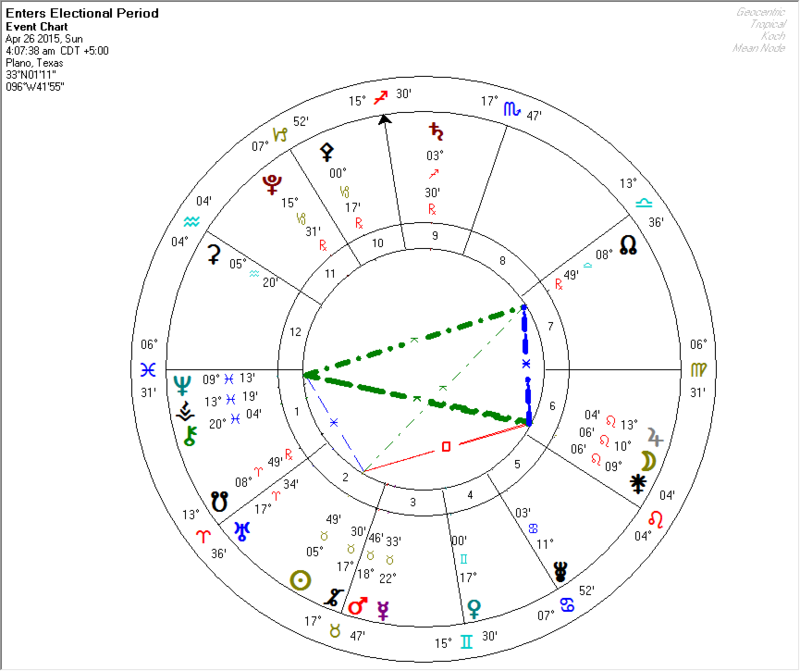 That the two patterns are linked by Mercury (the Prince of Thieves) worsens matters. 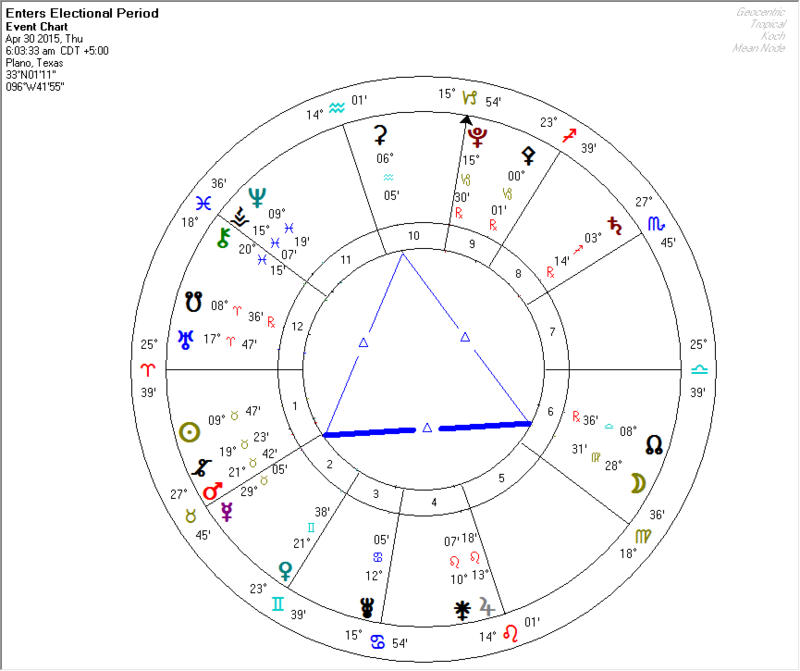 Far more than usual, this is truly a day to be careful about who you trust with your confidences. No yods are afoot in this chart, so this is not about your decisions or “big decisions” EXCEPT in terms of who you are choosing for your friends and who you are choosing to spend time with. Pick well. Be assured of one thing: change is afoot. Your old allies may no longer be friends, and you may find yourself in league with strange bedfellows once this New Moon has passed. See, also: “Bing and Google and Treachery” for a take on how this has been unfolding for this blog! 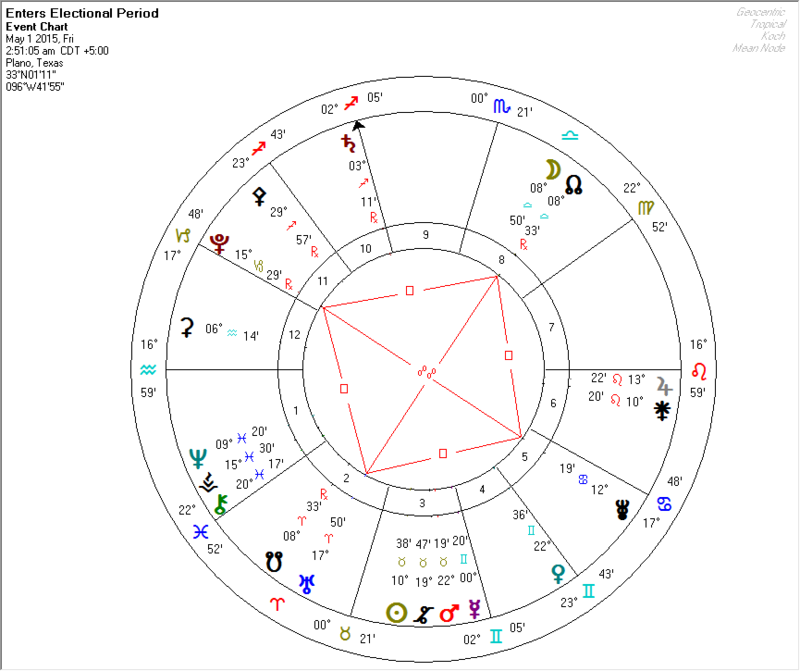 You can “get things done” with this new moon, but it might be best to work alone without disclosing your plans to others.